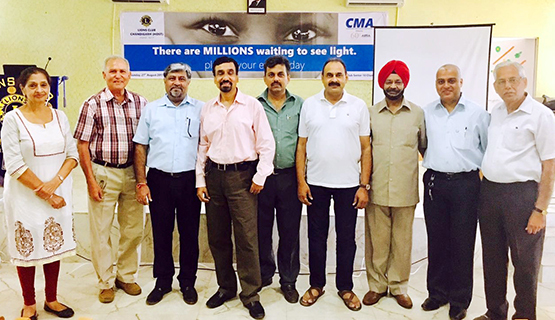 CMA jointly with Lions Club Chandigarh (Host), organized an Awareness Program on Eye Donation on 27th August 2017. Dr. SK Arya, MD, MS, FIACLE, Professor and Head of Ophthalmology Department, GMCH, Sector 32, Chandigarh was the key-note speaker of the session. To connect the speaker with audience, an online survey was designed and conducted by Mr. Hitesh Kumar Gulati, Secretary General, CMA. As many as, 69 members participated & the results were included in the session. The session was opened with a short documentary by Mr. Deepak K Dhingra, President, CMA. Dr. Arya cleared the myths, misconceptions and superstitions associated with the concept of eye pledging and eye donation. He also elaborated the legal aspects and the doubts of the audience associated with the eye donation.